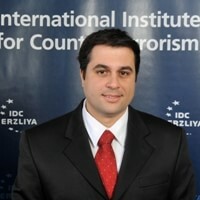 Dr. Michael Barak is a researcher at the Institute for Counter-Terrorism (ICT) of Lauder School of Government Diplomacy and Strategy, at The Interdisciplinary Center (IDC), Herzliya, and serves as the Team Leader of the Global Jihad & Jihadi Websites Monitoring Group and the Team Research Manager of the ICT Cyber-Desk In addition, He teaches as well in IDC courses on Terrorism and Islamic radical movements. Dr. Michael also serves a researcher and a member of the Social Media Networks in the Arab World (Beehive) research board at The Moshe Dayan Center for Middle Eastern and African Studies (MDC) in Tel Aviv University (TAU). Prior to his current post he was the Team Leader of the Arabic, Turkish & Persian Online Media at The Arabic Press Archive of MDS, and a researcher assistant on Palestinian issues at the Tami Steinmetz Center for Peace Research at TAU . He has been teaching Spoken and Colloquial Arabic for more than a decade at various institutes including the Arabic Language department at TAU, the Delegation of the European Union to the State of Israel, as well others. Dr. Barak holds both a B.A. and an M.A. degree in “Middle Eastern Studies” and “Arabic Language” from Tel Aviv University. He has finished his PhD at the School of History in Middle Eastern and African Studies, TAU. His PhD dissertation is concerned with “Sufism in Wahhabi and Salafi Polemic Discourse in Egypt and the Mashriq (Arab East) 1967-2001”. He has published several articles in Hebrew and English on Modern Salafism and Sufism in Egypt and on prominent trends in the Social Media Networks in the Arab World. He has lectured in several research forums including the IDC, TAU, The Hebrew University in Jerusalem, and Ben-Gurion University of the Negev. He has participated in several international programs including: “Study of Turkish Language and Culture” at Boğziçi University, Istanbul (2006) and “Study of the US National Security Policymaking” at the Institute for Training & Development (Amherst), USA (2014). In October 2018, the Egyptian regime declared on several occasions that the war against terrorist operatives in the country has been very successful and has curbed terrorism almost completely. The President of Egypt, Abdel Fattah al-Sisi, announced during his visit to Russia on October 16 that the “Sinai 2018” military operation, which began in February 2018 with the aim of wiping out terror cells in northern and central Sinai, achieved impressive results. The Media System of the Islamic State: On the Road to Recovery? The Islamic State’s media system and its wise use of social networks helped the organization reach many target audiences around the world and recruit many young people to its ranks. With the loss of the organization’s strongholds in Mosul and Iraq in 2017, its media system took a turn for the worse; namely, a marked decline in the quantity and quality of its publications.